There has been no shortage of players billed as Diego Maradona’s successor, yet few, if any, have borne that burden with the aplomb of Lionel Messi. Blessed with a wondrous left foot, outstanding vision, near-unstoppable dribbling skills and sublime technique, Messi is a sight to behold. Add in his explosive changes of pace, timing and nose for goal – a trait particularly in evidence in 2010 – and you have a player able to change any game in the blink of an eye. An important factor in the move was the Azulgranas’ offer to pay for treatment to correct Messi’s growth-hormone deficiency, a condition that led to his nickname of La Pulga (The Flea), which had proved prohibitively expensive for his Argentinian suitors in the midst of the country’s economic collapse. Messi’s La Liga debut came in late 2004 and he definitively exploded onto the Spanish football scene the following year. His first goal, fired on 1 May 2005 against Albacete, made him the club’s youngest ever goalscorer, a record he held until beaten by Bojan Krkic in 2008. The years 2008 through 2010 have cemented Messi’s rise to superstardom at Barcelona, where to date he has won three La Liga titles, the UEFA European Supercup, the Copa del Rey, three Spanish Supercups, two UEFA Champions Leagues and one FIFA Club World Cup crown. What is more, after scoring in the finals of the latter four competitions in 2009, the Argentinian was rewarded with that year’s FIFA World Player award. And after scoring 38 goals in all competitions in 2008/09, La Pulga surpassed that total in 2009/10. 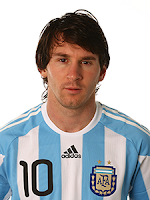 At international level, Messi mirrored Maradona’s achievements at Japan 1979 by inspiring his country to victory at the 2005 edition of the FIFA U-20 World Cup in the Netherlands. A member of the Albiceleste squad for the 2006 FIFA World Cup Germany™, he made three appearances, two as a substitute, but remained on the bench during the quarter-final exit against the host nation. Part of the Argentina side beaten by arch-rivals Brazil in the final of the 2007 Copa America, the following year Messi was a key figure in the team which stormed to gold at the Olympic Football Tournament in Beijing. And though he is yet to hit the heights of his club form in the blue-and-white of Argentina, Messi is determined to do that come South Africa 2010: “In order to become a legend, I have to win the World Cup,” he says.